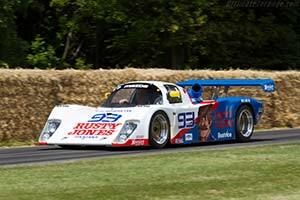 Deceivingly diminutive, the Tiga Group C and IMSA GTP cars were blisteringly quick; in 1985, Gordon Spice and Ray Bellm won the inaugural Group C2 championship with a four-cylinder engined example. To broaden the market for the cars, company founder and chief designer Howden Ganley created an altogether bigger Tiga for the 1986 season. It was dubbed the GC286 or GT286 depending on whether it was built to Group C2 or IMSA Lights specification. The new-for-1986 Tiga was built around a particularly strong aluminium honeycomb monocoque chassis. With an eye on maximising the size of the ground-effect tunnels, the suspension was in-board at the front and rear. A choice of engines was available with the Cosworth DFL V8 and the Buick V6 the most popular choices for Group C2 or IMSA Light use respectively. Mated to a Hewland five-speed gearbox, most engines could be used as semi-stressed members of the chassis. The 1986 was clothed in a straightforward carbon-fibre composite body. Ironically one of the new Tiga's biggest rivals was another new car, built by former Tiga racer Gordon Spice. Built to a higher standard, the GC286/GT286 Tiga was more expensive than the comparable Spice. Nevertheless, ten cars were sold and delivered in 1986. Faced with works Spice and Ecurie Ecosse teams, the privately run Tigas struggled in Group C2. In the United States, the cars were more successful with a total of four wins. For 1987, Ganley modified the existing design detail and a further five cars were constructed. A single victory in Group C2 was scored, while Tigas also struggled in the American IMSA Series. There was more success in 1988 when the Essex Racing fielded, Buick powered Tiga won the IMSA Lights Championship. By that time, Ganley had already sold the company. Without his driving force, the small manufacturer struggled and closed shop within two years. Recently, the Tiga name was dusted off with a plan to return to Le Mans.